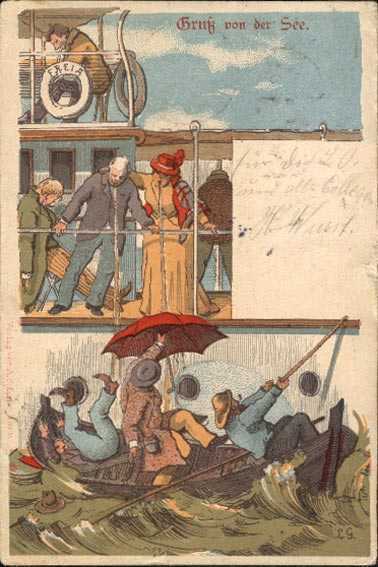 This amusing picture postcard was mailed aboard the German excursion ship Freia. Its handling was standard paquebot procedure. The purple postmark reads "Salon of the Fast Steamship Freia From the High Seas." The illustration reads "Greeting from the Sea." The card was put ashore and into the mails in Sandvig. Bornholm southeast of the southern tip of Sweden. From there the card went to Allinge which is right next door to Sandvig. The Tisland is probably a misspelling of the Danish Tyskland for Germany. 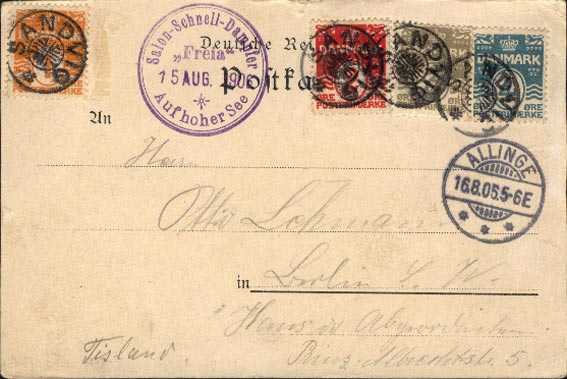 The cover is franked with the first four stamps from the 1905-17 numeral series. There is a 1 o orange, a 2 o carmine, a 3 o gray, and a 4 o dull blue (Scott 57-60). There are four Sandvig CDS and one Allinge CDS. *Thanks to Knud-Erik Andersen for providing Berlin in answer to my question. Thanks, too to Bjorn Munch for his supplemental information on the address and rate.